When it comes to numbers, well, not everyone likes them. Even if you do, you probably like to solve math puzzles or sudokus. Accounting, on the other hand, is a completely different universe. It requires not only great mind for figures but also a vast knowledge of tax law, and company’s policy. Even budgeting and invoicing takes time and requires great focus from the one who is doing it. Yes, it is a difficult job. Also much needed (accounting consultants are on top of the list of people sought for consultations online – check our article on the topic). That is why, to use the services of such person, we must have a considerable amount of money at our disposal. We can, of course, take our chances and do try to crunch the numbers. However, if we do not have experience and knowledge, this may end up pretty badly. A small mistake can cost us a lot of money and trouble. This is not worth it. But what can we do to save some money? Well, we may be able to help. If you work as a freelancer or a member of a small startup that cannot afford to hire an accountant, we have an application that can help you with budgeting and invoicing your work. This way, accounting will get much easier too. 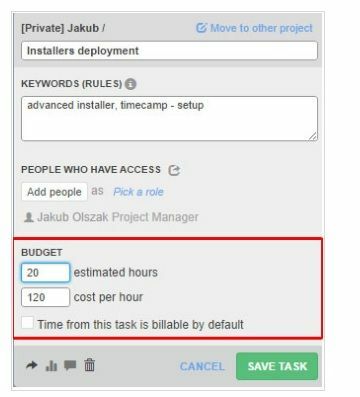 You can set a time budget for each task. This will help you monitor your team’s performance and properly judge task’s profitability on an ongoing basis. You can easily compare the progress of tasks by generating the proper report or check it in task’s single report view. In order to set the budget, go to the Project Management page and pick the task that you want. Find the Budget section on the edition panel. Enter preferred value for ‘estimated hours’. Keep in mind that if you have subtask(s) added, time spent on them will count to the estimated time. If subtasks have their own estimated time, those values will add to the parent task. For example, if Task A has 20 hours of estimated time and its subtasks B and C have their own estimation set to 5 a piece, the total estimation for Task A would be 30 (20+5+5). You can quickly compare tracked time with the budget by generating proper Report. Simply select the Project Budget type of grouping. Invoicing is a bit more complicated, that is why by the end you will find a link to our knowledgebase, where every detail is described separately and thoroughly. Now, we will focus only on the basics, just to give you the idea. 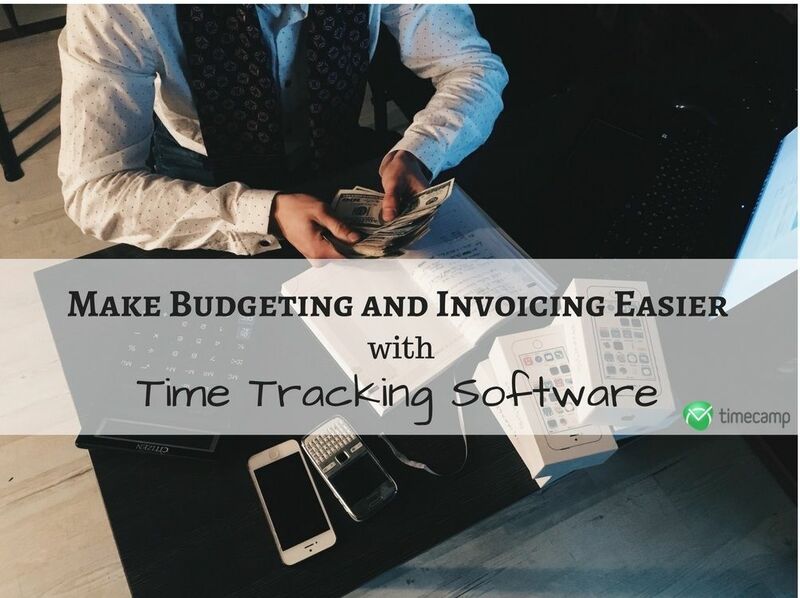 TimeCamp Invoicing system allows you to easily issue invoices to your customers either based on time you’ve gathered for projects and tasks or simply by creating a blank document. You can automatically fill up invoices with proper rates by settings hourly costs for either tasks or users. Invoices can be sent to your Clients directly from TimeCamp via email. You can also generate a public link or download them as PDF files and later share them however you prefer with your contractors. 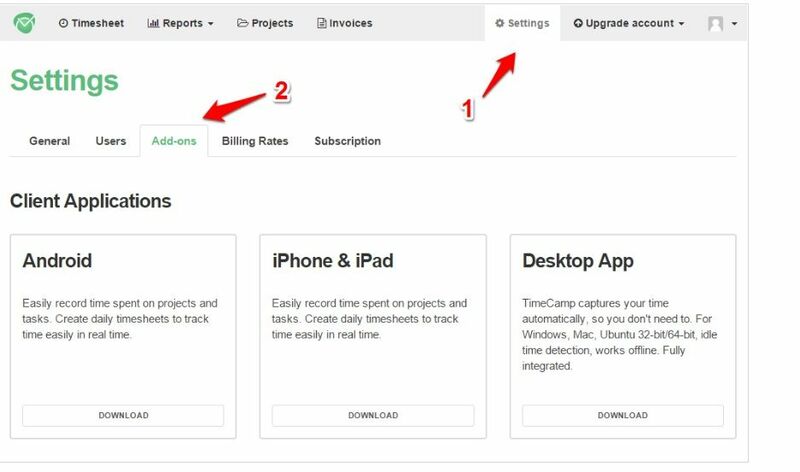 You can also integrate with TimeCamp with your PayPal account and track your payments for issued invoices on an ongoing basis. Last but not least, if you’ve integrated TimeCamp with Xero or Quickbooks, you’ll be able to easily export invoices from TimeCamp to your preferred accounting software. Start by entering your company’s details in TimeCamp settings (1). Enter “Add-ons” bookmark (2). Find “Invoicing on the list and click on blue Settings button. Enter your company’s name (1), address (2), and – optionally – upload your logo (3), which will be visible on issued invoices (3). You can also – optionally – enter PayPal email address if you wish to grant your recipients the ability to pay for invoices through this service (4). Note that you can also manage your taxes in the right panel of this page (5) – they’ll be available for you to choose from while creating invoices. It is all meticulously explained in our knowledge base right here. Summing up, before you decide to seek the help of professionals, try the simpler and more profitable solutions. Like (a completely random example) a great time tracking software that we produce. Everything That You Need to Know About Time Tracking!